How can you guys tell? The only thing I can see is maybe that the cuff elastic is black instead of blue? Could the colour difference be because it is from an older season? cuff elastic is contrasting instead of tonal, giant sloppy stitches on the inside of the cuff instead of the usual veilance microseam work, inside doesn't look like proper goretex cknit (it's more white instead of the smooth silvery look), seam taping looks bad/i dont see the cool circular reinforcements where seamtape meets, interior stretch pocket is black with blue zipper instead of tonal/white, i dont think the hood of the ebay one has the black suede-esque material where it sits on the neck, the font on the hangtags are bad, the hangtag itself is attached with plastic instead of the stiff black cord thing, there's an extra white tag on the hangtags, the correct color is "Mid Navy" not "Blue" as shown on the tag, etc. I love nerdy SuFU gets. 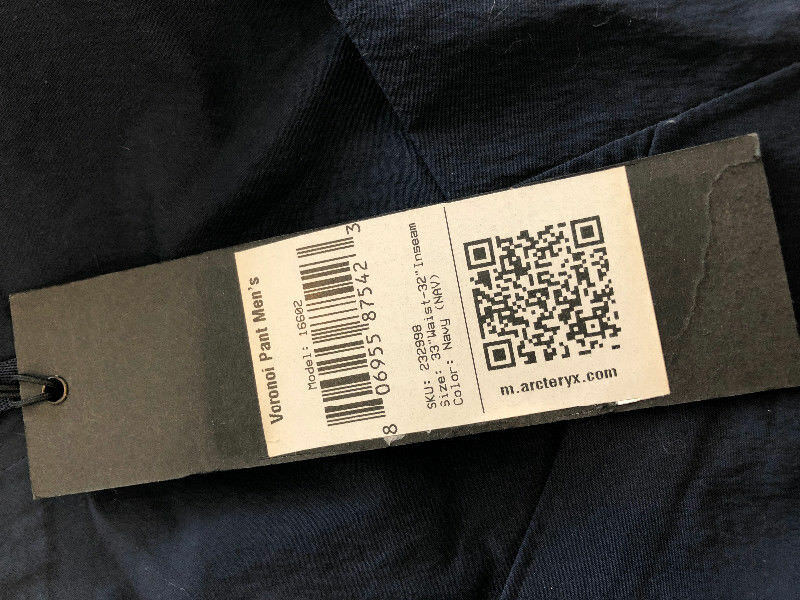 So far the dead giveaway in most products are the tags and tag positioning. Terratex Voronoi owners, does this look fishy to you? The grey tag on mine are sew closer to the waist and do not have the black laminate behind. Also the tag looks a little off. That would be my pair and actually the guy who bought it from me put it on grailed again but for $200 more than what I sold it. The reason it delam'd was because I had the pants tapered from the knee to the hem without proper procedure. My tailor added a seam along the back of the leg where it's a bit hidden. Fit wise it worked however the fabric was noticeably affected by the alteration. It delam'd very slightly at first but as time went by as I kept wearing the pants continuously, the delamination got worse. Your pair will not delam in any sort of way mine did. Follow similar goretex care instruction if you're wearing it constantly wash at least once a month. What would be the proper procedure for tapering a pair of veilance pants? I would think you'd need to untape the seam, taper, hem for length, and then retape the new seam? Anyone interested in buying used Operand Shirts or Dyadic Sweater please check the market page.. And please feel free to send me offers or price suggestions as I'm not quite sure what's reasonable.. Cheers! It's important to remember that the reason they don't just come out and say "we're working on X" is because sometimes they're working on it, but it doesn't work. Sometimes it fails and they have to put it aside for a while. The very first season of Veilance was supposed to have an accompanying side-bag. Obviously that didn't come together in time—and then it never came together. They're probably looking at all sorts of things right now... expanding the Nomin line, working with film-out Gore-Tex, using different materials for wallets and other carry goods... but we probably won't see half that stuff, just because of how the design process is. 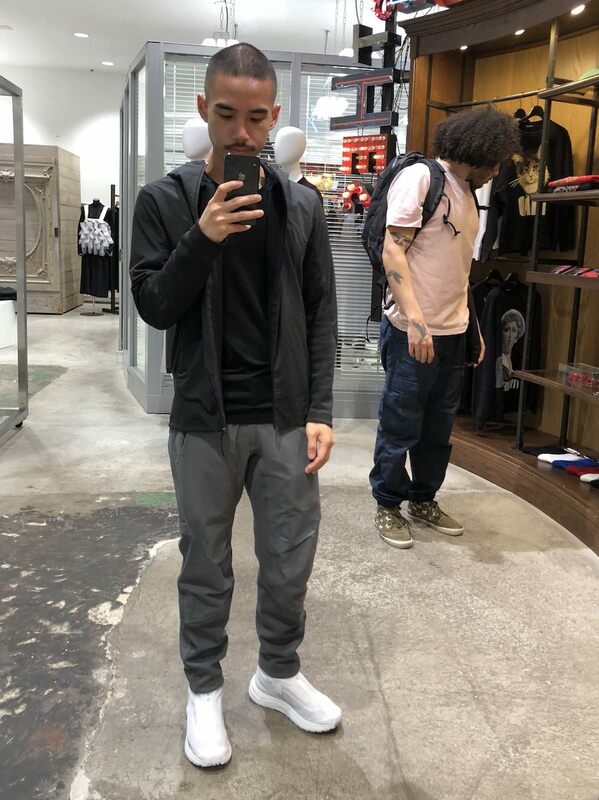 has anyone tried on the apparat pant with the 50/50 nyco material update? i already have a pair of convex pants, so if anyone's tried on both and can comment on fit differences, that would be cool. i find the convex snug around the quads, but has a good amount of stretch to accommodate. just worried it will be restrictive if i get the apparat in the same size. thanks! Apparats definitely felt tighter overall. IME they fit 1-2 sizes smaller than the convex. Thanks for the tips! One thing to note though is that the tonal interior pocket seems to be a recent addition? I found these pics of I'm assuming older versions of the Arris with a contrasting interior pocket. The ebay one is way off though, with a black interior pocket instead of a blue one. Has anyone tried layering the Sequent LTs over the Dyadic comp pants? anyway, ive been traveling and love the Roam collection or whatever. dyadic comp hoody and pants is warm enough for the plane, cozy, lots of storage, not too hot, terratex hood stops even moderate rain, etc. my only thing is it's not the most packable and the terratex makes it feel a little heavier. it does, however, make it feel psychologically durable enough to wear on its own. outlier's doublefine merino hoodie is much more cozy though, but it does feel too delicate. heres a fit pic. at first, i was disappointed with the comp hoody cuz i really wanted to layer it underneath a lot of stuff. ive been using it under my achrom and quoin jacket but the terratex makes it a little heavy as a midlayer (just feels.. not right). and the length sticks out under shorter jackets like the mionn IS and achrom IS, so it looks silly. but on its own in like 50F+ it's really cool. probably starting to become my favorite piece from this drop, like field OS was for me last year. Nice fit but, man, I hate those kicks. There was some discussion about the new Field LT Jacket being cut quite slim a while back but was there ever a consensus about sizing? Measurements on Haven make it seem very very slim, enough to size up. You´d recommend the dyadic hoody then? Been eying the for a couple of weeks now and thought it could possibly be a lightweight jacket for mild temperature. 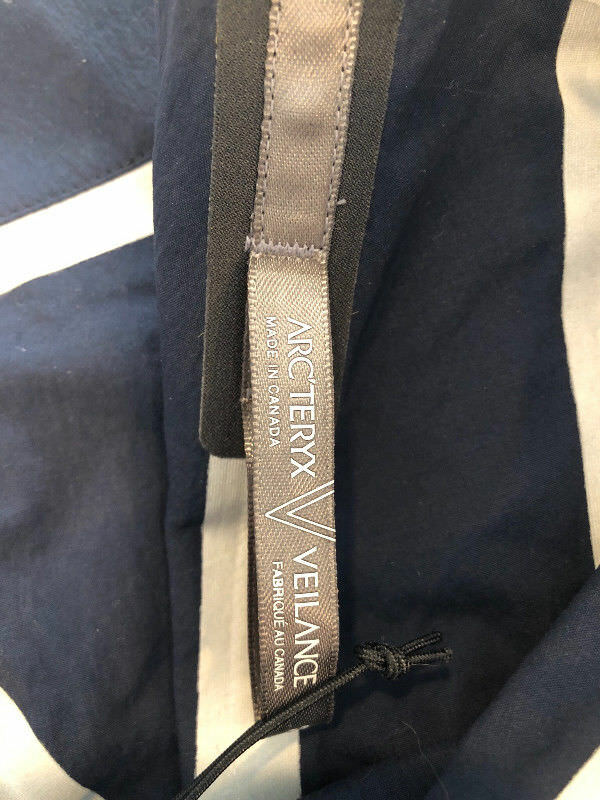 @ all: Did anyone of you consulted the AV customer service for a replacement for the elastic cuffs on an actuator jacket? I got a new Arris jacket as a replacement for my Actuator jacket. Reason was the elastic at cuffs and waist. 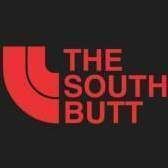 i somewhat can not access the page related to that file. I´ve considered to keep the actuator as it´s still in decent condition especially after the grangers treatment, just except the cuffs aren´t elastic anymore (SS14 Model). It would be quite the hassle for me to get the replacement done by arcteryx (shipping etc.) so i´ve been debating with myself if it´s worth it or not. Is the arris a good compromise? I have no idea if anyone of you actually buys mainline arcteryx clothes, but could you make it work to wear a down vest (cerium) underneath the arris? The actuator isn´t as multi-purpose as i wish therefore it´s only suitable for warmer temperature since i can only fit a T-Shirt/ LS Shirt underneath. The ‚file‘ was a mistake. There was nothing behind it. The Arris is a much better jacket, better Goretex Version and better cut in my eyes. I think a Cerium vest in same size from Arc main line will not really fit underneath the Arris. One size smaller might work. I use the Quoinn vest instead. The Field pant is easily the most constricting pair of pants I own in terms of ease of movement. I don't know if that says more about my collection of pants (which consist mainly of Acronym and super wide fitting denim and fatigue pants) or the cut of the Field pants. Allthough it is stated on Veilance page that the cut is articulated, this can't be to a major extent. There aren't any visible seems that point to articulation in the knees that I can find, for example. Regarding the cargo pockets, they are surprisingly big. But it's not that comfortable to fill them up with stuff, seeing that the pockets are 'built in' under the face fabric of the pants. Compared to the Acronym P10A, where the cargo pockets are constructed on to the face fabric of the pants, this makes objects in the Field pant cargo pockets press on the thighs, where the P10As don't have that same problem at all. Maybe it's unfair to compare those pants seeing that the construction of the cargo pockets are that different, but it's something I quickly noticed when first trying the Field pant on. I guess the Field pant 'built in'-style cargo pocket is the most common cargo pocket around, so most pants with cargo pockets offer the same feeling when stuffed. The material is pretty interesting. Allthough I was hoping the knit lining would add some more warmth for the cold winter. The material reminds me of a thinner version of the mainline Gamma AR-pants that I own. Both in handfeel and stretchiness. Visually the pants are super sleek and clean, so they look very on point. very interesting. how did you size? i went +1 from my TTS and they are probably one of the most comfortable pants i own. the windstopper (to me) is far more conducive to movement than a lot of the other items in my wardrobe. i mostly agree about the pockets even with a looser fit. i haven’t had issues utilizing the organizer pocket inside and that fits very comfortably. the main pocket I usually just use in a pinch. I agree about the warmth. i think the thought process was similar to not giving the monitor lined pockets. they make it slightly less optimized to winter to allow for more wear in warmer weather. just a theory though. I would reason comparing wide fit pants to a slim cargo like the Field isn't the most fair. You're right, the pant doesn't have much articulation beyond the crotch gusset, which does extend to the thighs and adds some shape. I don't feel constricted wearing these as compared to my other Veilance pants. I went TTS and they're very comfortable, though the back rise could be a little higher. The pocket bags are cut with quite some volume and if you keep you load light, you'll be good. I don't think the intention was every to accommodate 3 boxes of Poky and a bag or Cheetos. The size I assume was more for a small notebook or tech. The organizer pocket I use for by ID card. I might have given off too much of a negative vibe regarding my opinion on the Field pant. I actually really like them, and they might turn out to become one of my favourite pants. I just had some comments on how my own expectations of the garment didn't match the actual garment. I went TTS. And it's not that the pants are that constricting per se, it's more that compared to most of my other pants, which are articulated or wide fitted, I can bend my joints and not notice the limitations of wearing pants. I completely agree that it's not fair to compare the Field pants with wide fitting pants, of course. It's just that it says that they're articulated, but they're really not that articulated. I wasn't expecting anything like the P10A's, or anything, which are super articulated. The only other Veilance pant I own is the Sequent, and it is cut slightly wider in the hips and thighs, but is shorter in length. This makes the bottom of the pants rise up pretty high on my leg when crossing my legs, for example. Regarding the cargo pockets - I have an Iphone 6 plus, which is huge, and the pockets don't accommodate it in the best way. It feels kinda awkward having it in there. But again - it doesn't fit in most other pockets either, so... But coming to think of it, I think most other cargo pockets are built military style on the outside of the facefabric so they can accommodate more stuff and expand. So what I said earlier isn’t quite correct, I think. I guess I just find it a little strange to have such voluminous pockets that aren’t that comfortable filled up. I posted them on eBay with real pictures.. You should be able to find them with keywords or please just message me and I can send you the link. Cheers chaps. looks kinda fake tbh. the tag says "mid navy" which shouldn't be nearly as bright/vibrant as the one shown (unless it was a color from way way back). if you're thinking of buying it on grailed tho, definitely get em to take a pic of the model number and sku on the white tag, and get your local arc store to check it over. I don't want to buy it but I've seen a seller on Grailed move a ton of Frame LS in the 'Ash' and blue colour shown. If they're fake, feel sorry for all the buyers.